Grant Forrest is taking on Ian Poulter’s brother and a former England cricket star in the East Lothian star’s opening test in his first full season as a professional golfer. He’s among the hopefuls in the MENA Tour Qualifying School, which begins today in Morocco, with Forrest aiming to use the third-tier circuit as a back-up to the Challenge Tour. “If I get a card, I’ll stay on in Morocco for the first two tournaments, which are the Casablanca Open and the Royal Golf Mohammedia Open,” said the 23-year-old. 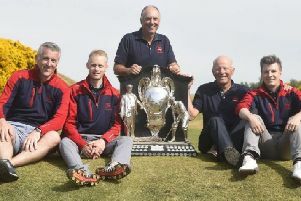 Ayrshireman Jack Doherty is among Forrest’s rivals in the 54-hole event, as are Danny Poulter and Craig Kieswetter, whose cricket career was cut short at the age of 26 after a horrifying eye injury. “My game is feeling really good,” added Forrest, who finished just outside the top 40 on his pro debut in the Dunhill Links Championship last October.